A prairie is being reestablished in the Midwest where early settlers, then explosives production workers, then uranium metal producers once worked. 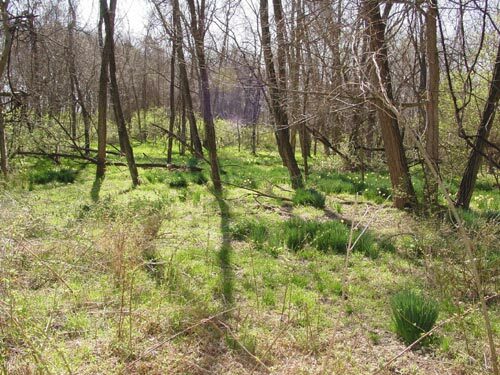 Native plants, such as Prairie Blazing Star, Little Blue Stem, and Wild Bergamot, will once again dominate an area of roughly 150 acres, following a major cleanup and restoration of a Superfund Site known as the U.S. Department of Energy's Weldon Spring Site Remedial Action Project (WSSRAP). The Weldon Spring Site is located 30 miles west of St. Louis, Missouri. The site was originally homesteaded in the 1800s by various groups of settlers including a group led by Francis Howell. The villages of Hamburg and Howell were thriving in the early 1900s in the southeastern part of St. Charles County along the banks of the Missouri River. Then, as the United States prepared to enter World War II, the Department of the Army, under a state of emergency, acquired 17,232 acres of land which permanently displaced the villages and surrounding farms. Atlas Powder Company, under contract with the Army, operated the trinitrotoluene (TNT) production plant which the Army built on the land. In the 1950s, much of the land was transferred to public entities. Part of the remainder of the land was kept by the Army for training purposes with the rest going to the Atomic Energy Commission (AEC), predecessor to the Department of Energy (DOE). The AEC built a Uranium Feed Materials Plant (later called the Chemical Plant) in 1955. The plant took "yellow cake" (uranium ore concentrate), converted it into uranium metal and shipped it off for further processing at other sites. The uranium was ultimately used in both the nuclear weapons (supporting the cold war efforts) and nuclear fuels cycle processes. In December of 1966, the AEC ceased operations at the plant and it was placed under caretaker status. In 1986, the Department of Energy began efforts to clean and restore the area. A quarry, which had provided aggregate for the chemical plant site and was subsequently used for waste disposal in the 1950s and 1960s, was also included in the cleanup effort. The quarry was placed on the US Environmental Protection Agency's (EPA) National Priorities List (NPL) in 1987 with the chemical plant joining the list in 1989. Clean up field activities concluded in October of 2002. Total project cost is expected to reach $905 million. Weldon Spring Site, May 2003. A major factor in preventing leachate (water which has percolated through contaminated materials) from entering the groundwater is the system of liners and removal systems. 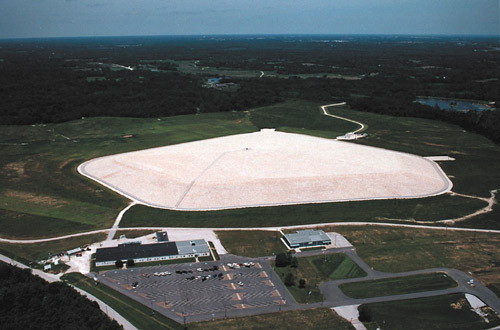 Included in the cell's base is a multi-component liner system consisting of three feet of compacted clay, followed by a geosynthetic clay liner, a geonet, an 80 mil white textured-surface HDPE liner, and 160 mil geosynthetic fabric. More information on the disposal cell and the Weldon Spring Site can be found on the website www.wssrap.com. Part of the long term commitment of the DOE is to act as a responsible steward of the land. In that respect, the DOE will maintain long term monitoring and maintenance programs and will also provide educational and research opportunities to future generations. With this in mind, the haul roads (used to transport contaminated material from the quarry 4 miles southeast of the site and to transport clay from a borrow location 1 mile away) were converted to a hike and bike trail. The trail is a spur off of the historic 180 mile Katy Trail which is a "Rails-to-Trails" conversion stretching from St. Charles to Clinton, MO. The new trail, known as the Hamburg Trail, progresses from the quarry to the chemical plant and ultimately to the August A. Busch Memorial Conservation Area Headquarters. This trail is roughly 10 miles in length. Just off of the Hamburg Trail, visitors can access the disposal cell by climbing steps to the top of the 75 foot tall cell to a viewing platform. From this lookout, one can take in the 360 degree panorama of the surrounding terrain. On a clear day, the top of the St. Louis Arch can be seen 35 miles to the east. 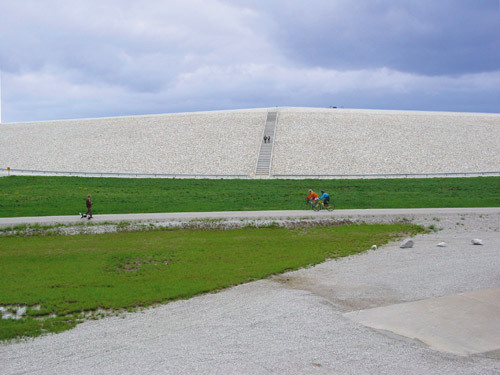 Hikers and bikers ejoy the Hamburg Trail as visitors descend the steps of the disposal cell. The former maintenance shop/access control building was remodeled into an Interpretive Center where displays of the various facets of the site's history can be seen. A pictorial timeline illustrates the history of the area along with displays of the fundamentals of radiation, the geologic setting, the subsurface investigations performed, and the cleanup of the site. The Weldon Spring Site Interpretive Center seeks to serve as an integral component of stewardship communicating to all visitors the historical legacy of the site and to provide educational and research opportunities to future generations. The ribbon cutting for the Interpretive Center and dedication ceremonies were held on August 5, 2002, and DOE Assistant Secretary of Environmental Management, Ms. Jessie Roberson, gave the keynote address. "The Interpretive Center was built to preserve knowledge of the remediation work and the historical significance of Weldon Spring and to pay tribute to the thousands of Missouri workers who played an important role in the defense of our nation. It is a tribute to the many people who have committed to the goal of restoring one of the nation's hazardous waste sites into an historical landmark and recreational area. The dedication of this Interpretive Center is a major milestone in the successful restoration of the site and the effective long-term stewardship." Remnants of a Howell Prairie homestead. DOE is committed to revitalizing the Weldon Spring Site to a natural and native ecosystem and is in the process of creating a 150-acre prairie around the disposal cell that extends to the site boundary. When complete, the prairie will be one of the largest plantings of its kind in the metropolitan St. Louis area. The history of the original Howell Prairie extends back into the late 1700's when Alexander Andrews obtained his Spanish Land Grant (Survey 887) on Nov. 10, 1797. He subsequently sold the 640 acre parcel to Francis Howell Sr. on Jan. 19, 1800 who then built his homestead. Francis' son, John Howell, purchased an adjacent Spanish land grant parcel (Survey 453) which was roughly half the size of Survey 887. This area became a way station for travelers heading east and west, to or from St. Louis. The early settlers were close friends of Daniel Boone and 3 of Howell's daughters married Boone grandsons. This property was amongst the many which were taken over by the Army in 1940 for the ordnance works. The design for the new prairie began in the early 1990s when native grasses were deemed to be the best solution for site restoration. Most of the site saw excavations of contaminated soil, foundations of old buildings, and removal of waste pits. Therefore, a large portion of the original site surface was removed and placed in the disposal cell. In many areas, several feet of earth were removed. To maintain proper drainage away from the disposal cell, cut and fill activities along with borrow soils shaped the final contours of the land. The resulting surface was like a blank canvas waiting to be worked. Temporary plantings of cereal grains were used to help prevent erosion of the bare soil during the interim years of remediation. 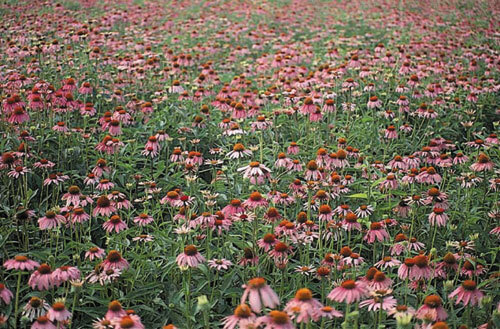 In late spring of 2002, the first permanent planting of prairie grasses and forbs was conducted. Soil samples had been taken of the mainly clayey material and a fertilizer mix of 2-30-18 was specified at an application rate of 333 lbs./acre. The low nitrogen content limited weed growth. No further application of fertilizer is anticipated. Seed was sown using a broadcast spreader. Dominant in the planting mix were prairie grasses (e.g. Schizachyrium scoparium (Little Blue Stem)) along with forbs such as Aster novae-angliae (New England aster), Chamaecrista fasciculata (Partridge pea), Dalea purpurea (Purple prairie clover), Ratibida pinnata (Gray-headed coneflower). One third of the area, next to the Hamburg Trail, was planted more heavily with forbs. This first planting included a nurse crop of annual rye.
. The highest success rate for germination is when one can emulate what nature does." A total of 4 lbs per acre of pure live seed have been spread during the two plantings. The area will include a series of paths and trails to allow visitors to see the prairie up close. Also planned for development at the site is a 5-acre interpretive garden that would complement the adjacent prairie. The Missouri Department of Conservation's 'Grow Native!' program will provide insight into what trees, shrubs, and plants other than prairie species could be planted in the interpretive area. The garden would include walking paths and educational signs that will identify the various plants and will enhance visitors' enjoyment of the garden. They can learn what a plant looks like and then search for the plant in the larger prairie area. DOE has formed a working advisory group of interested individuals to discuss issues and ideas associated with Howell Prairie. Topics include planning the development of the interpretive garden, addressing long-term maintenance issues of the prairie and garden, and promotion of educational opportunities to the surrounding community. Participants in the Howell Prairie Council include representatives from the Missouri Department of Conservation, Shaw Nature Reserve, St. Charles County Parks Department., Missouri Prairie Foundation, The Nature Conservancy, The Nature Institute, U.S. Fish and Wildlife Service, Missouri Department of Natural Resources and other local citizen organizations and individuals who are prairie advocates and experts. DOE's Weldon Spring Site Project Manager, Pamela Thompson, envisions this advisory group meeting on a quarterly basis. "This working group will focus on promoting awareness and appreciation of the native prairie; oversee the establishment and maintenance of Howell Prairie and educational garden; and promote and offer the use of Howell Prairie as an outdoor classroom, research site, and nature area." Some of the areas that the advisory group may address are: determining the success rate of specie germination, over-seeding requirements, sequencing of control burns and possible workshops on control burns for agencies and the public, weed control, etc. Some group members will act as links to community organizations for outreach not only regarding distribution of information but also for opportunities for volunteers to assist in maintaining and planting the prairie and interpretive garden. There also may be research possibilities such as reintroducing the Eastern Prairie Fringe Orchid into the area or planting of cool season prairie grasses and sedges. Howell Prairie and the interpretive garden will enhance the outreach and educational experience for local residents and visitors to the area. The DOE hopes that the prairie and garden will eventually serve as a 150 plus acre outdoor classroom for those interested in the study of horticulture, native plants, and prairie ecosystems. Visitors can hike or bike the trail through the site, go to the top of the cell to view the expanse of prairie in bloom at various times of the year, and visit the Interpretive Center and Garden. Recognizing that controlled burns are beneficial to the prairie, there may one day be a large group of tourists and prairie enthusiasts watching the spectacular site of a prairie fire. They will hear the crackle of the flames as it rushes through the prairie reminiscent of the time over 200 years ago when the natural cycle of the prairie was viewed by Native Americans and new settlers. Howell Prairie is back. For more information contact Marj Oaks, Site Project Manager, Stoller Corp., 7295 Hwy. 94S., St. Charles, MO 63304, (636)441-8086, fax (636)447-0739.